"Who wants fried junk food in a bag from the store? These corn chips are warm, crunchy, and kicky. Try them with guacamole, salsa, or as nachos." Place a rack in the top third of the oven and preheat oven to 400 degrees F (200 degrees C). Arrange corn tortillas in a single layer, with no overlap, on a baking sheet. 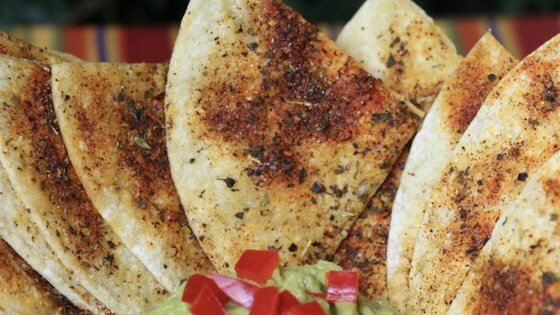 Brush tortillas with oil; sprinkle garlic salt, oregano, and chili powder on top. Bake in the preheated oven, with the door slightly ajar, until crispy, about 7 minutes. Cool for 2 minutes before serving. I didn't leave the door open but I did everything else and it came out great.